The NickiHndrxx tour will be a can't miss outing for fans of the hitmakers who dominate the modern hip-hop and mainstream charts. The multi-award-winning artists are also known for their high energy performances of their chart-topping hits. Together, they are bound to bring the heat to the stage for an unforgettable night on this massive joint tour. The extensive outing will touch down in 50 cities across North America (produced by Live Nation) and Europe, kicking off September 21 in Baltimore, MD. The tour will visit Sacramento’s Golden 1 Center on Saturday, November 17. Tickets for the North American dates will go on sale to the general public beginning Friday, June 15th at 10 a.m. local time at LiveNation.com. 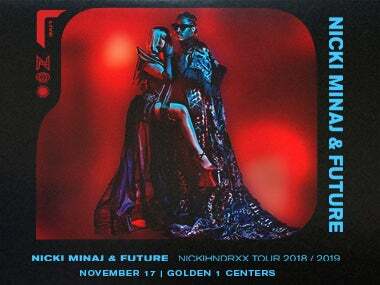 Citi® is the official presale credit card of the NICKIHNDRXX tour. As such, Citi® cardmembers will have access to purchase U.S. presale tickets beginning Tuesday, June 12th at 10 a.m. local time until Thursday, June 14th at 10 p.m. local time through Citi's Private Pass® program. For complete presale details visit www.citiprivatepass.com. Additionally, Live Nation, Artist Merch, and ZEDGE pre-sales will begin at 10 a.m. on Thursday, June 14th until 10 p.m., all times local. Minaj is set to release her anxiously awaited fourth full-length studio album "Queen" on August 10.